Blue damselfish are bold and aggressive. This feisty attitude has won them the nick name "blue devil". Vibrant blue in color, blue damselfish are a colorful addition to any saltwater aquarium. Males develop an orange tail with maturity, and females have a perfectly round small spot at the base of their dorsal ray. Blue damselfish are commonly found in Australia and the west Indian ocean. Blue damselfish are substrate spawners, laying their adhesive eggs on the substrate. Males prepare a spawning site by establishing a territory, cleaning a smooth surface of a rocky ledge, walled crevice or coral rock surface. The male blue damselfish completes the preparation in anticipation for a female to deposit eggs onto the substrate. 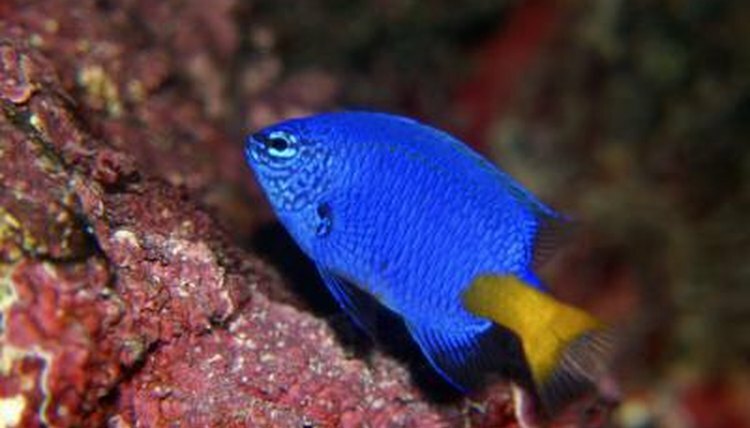 Male blue damselfish use tactics, such as emitting clicking sounds and displaying excited swimming movements to attract a female into his territory. Interested females will enter the spawning site, releasing up to 20,000 tiny eggs, adhering the eggs onto the smooth surface that was prepared by the male. The female then leaves the territory, leaving the eggs' safety to the male blue damselfish. The male blue damselfish immediately fertilizes the eggs by spraying sperm over the nest of eggs. At times, males will continue mating and inviting females into his established territory, repeating the courtship individually to each female. Males are capable of mating with several females. Males fearlessly and aggressively protect the fertilized eggs and the established territory from predators. Even guarding the eggs from the largest predators. Male blue damselfish care for their fertilized eggs by using their fins to fan water across the egg batches. The fanned water removes any debris that may collect on the eggs and cause harm. The male also removes dead eggs by consuming them. Removing them from the presence of the more healthier eggs, prevents the development of fungus or bacteria. Fertilized, healthy eggs hatch within seven days. The larvae drift into the open water and feed for several weeks on algae, fish larvae, microscopic animals and waterborne crustaceans. It can take up to three years, sometimes longer, for larvae to reach full maturity. The juvenile blue damselfish features solid blue coloring throughout the entire body, similar to females. Once they reach maturity an orange color appears on the tails of the males and a black dot appears on the dorsal fin of the female, visibly distinguishing the two sexes. The lifespan of the blue damselfish is five years.